Heavenly blog! : No. 1315: Anders Torp has taken Thurs the 1st step to recovery, something we all need to learn from! No. 1315: Anders Torp has taken Thurs the 1st step to recovery, something we all need to learn from! Anders Torp has taken Thurs the 1st step to recovery, something we all need to learn from! Facsimile image there Jan Aage Torp reverses out their hatred against me and the Heavenly blog! Jan Aage Torp also get "emptied" himself, but he thinks he is doing God's will, but it's nothing but you and bile that comes up and forward! Here it is probably not something incitement to a humiliation recognition of something other than oneself is super and is a world champion. But the truth about Jan Aage Torp is that the church in Laodicea when he is captured by the same spirit as they were in the church at Laodicea. From my commentaries Revelation 3 16 But thou art lukewarm, not cold and not hot. I will spit you out of my mouth. Jesus goes so drastic action as in Matthew 23. When he rebukes the Pharisees and scribes. Now Jesus uses the same powerful verbal attack against his own church, or they are no longer his church? They live in a spiritual self-deception that Jesus opposes strongly. Because you are lukewarm, he queasiness over them! Matt. 7. 21 Not every one that saith unto me, Lord, Lord! shall enter the kingdom of heaven, but whoever does the will of my Father. 22 Many will say to me in that day: Lord, Lord! Have we not prophesy in your name, and cast out demons in Your name, and done many mighty works in your name? 23 And then I will declare to them, 'I never knew you. Away from me, you evildoers! 17 "I am rich," you say, "I have abundance and lack nothing." But you do not know that you are wretched, and miserable, blind, poor and naked. This duality which basically is hypocrisy Jesus warns against strongly. Here believe the church to be rich, successful and everything is in the perfect and the best order. But it is exactly the opposite. Lousy can stand for the care for those who fall without past is gone, a grower only friendship with their own friends. Pitiful stand to lack spiritual backbone. Blind is no longer tell the difference between something in the spiritual world. Poor are losing the gifts and fruit of the Spirit. Naked is losing salvation garment. Here was the church in the deepest and utmost spiritual needs and requirements. Anders Torp has come forward with its horrific and traumatic history, the lesson for us all. It's like he is about to rest lately, as everything has skjert themselves! For lessons also for us, and hopefully. So Anders fine God, not to God, then he probably never have known God through the extreme business he grew up in. No matter, God knows, and knows Anders and all our hearts. The point is where we are today and where we are going, the way forward! There are two things that are coming forward, which is good! 1.) He has pointed out what was bad. 2.) He is "emptied" himself, that is legend! When he has two steps back, to get the "target". We will never be a goal but when he comes not in God my life. 3.) Getting to the foot of the cross to be both forgiven and forgive. To mota salvation and to bring it on! 4.) Being filled with God's spirit, love and kindness. This is the goal for all of us, I think Andreas Torp is started on this pilgrimage. He is a model for everyone, because we all need more or less walk the steps in our lives. 1.) We have pointed out what was bad. 2.) We get "emptied" himself, that is legend! 3.) Getting to the foot of the cross to be both forgiven and forgive. To mota salvation and to bring it on! These four steps could be expanded, and written course more. But to try to limit ourselves and not lose focus, so I focus here only four steps. In many ways, two down and two up! There are some who writes about Anders Torp who does not realize that he has gone through traumatic and dramatic things. But the truth is that he fortunately expresses how bad it really was. But trying to find the way forward out of what he has gone through and what he has experienced in the spiritual area which of course has been badly beaten by his father in January Aage and mother Ann-Christin which unfortunately have been so far out on the spiritual astray it is possible to ?! 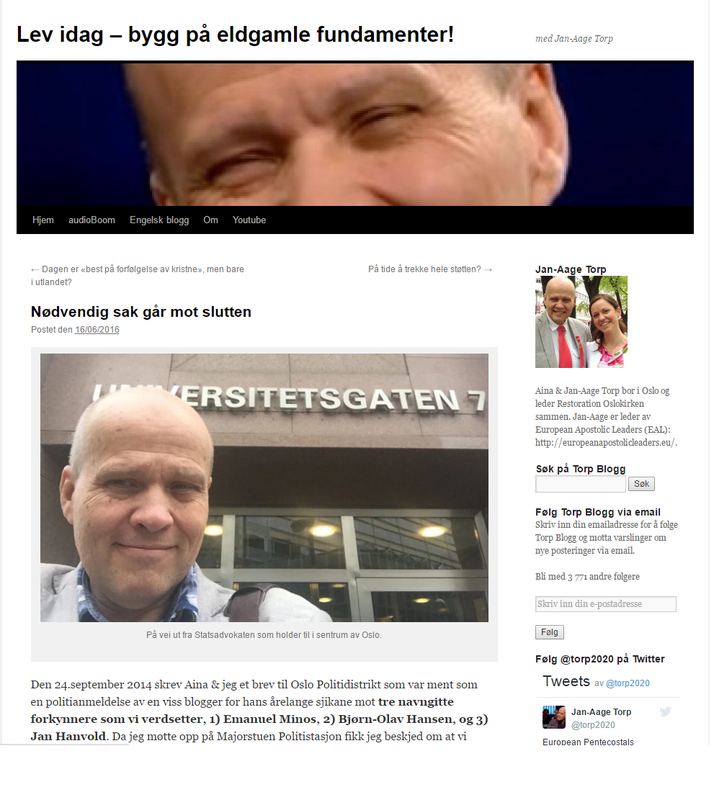 Read about much unwise and hersketeknikk being used against Anders Torp. Now let the boy get empty, and get feedback that there is anything wrong with him at all costs. But the error that is done for him, he has no fault in, this is where others have right index finger into pitches itself, if it succeeds ?! I could have spent much longer on this article. But know to stop here because I really ever said it's a healthy process for us all. before we get to meet God, the restoration and going where the Lord wants us. Anders Torp, I am convinced that he has come several steps closer, if even a few are left. It's a great boy or man who needs the faithful support and prayers, above the forefinger and admonition to change itself!